The Nuna Sena Leaf Curv Review: Is it Right for You? When you have a baby, there are a handful of non-negotiables when it comes to the accessories for your little one. Among them is a solid bouncer to keep your newborn or young baby entertained and to also soothe them when simply holding or rocking them won’t do. This is where the Nuna Sena Leaf Curv comes in and not just because it’s a brand that’s already plenty trusted by parents for top-notch baby accessories and necessities. With a small nudge from you to get it started, the lounger will move gently to soothe your baby and with little movements of their own, like kicks or arm motions can keep it going. This means that you will never have to replace batteries or worry about a motor dying on you from overuse because there are no cords, batteries, or buttons on the baby lounger. You can give your little one an alternative to lying in a crib or bassinet and allow them to stay in the common areas of your home all while being able to relax and keep your own arms free for a little while. It just adds some peace and comfort for everyone involved and it’s not bad to look at either with a simple sleek design that cradles your little one while keeping them safely buckled inside. On Amazon, the Nuna Sena Leaf Curv is $300. It grows with your baby to eventually be used as a comfortable lounger for your toddler. There are no batteries or outlets needed when it comes to the Nuna Sena Leaf Curv. There is mesh backing to the cotton fabric, which provides a little-added breathability to the lounger. The lounger can be popped out of the base when you need to store or transport it out of your home. There’s also a toy bar and wheeled travel bag, which can both be purchased separately to use with the Nuna Sena Leaf Curv. The shape of the lounger is perfect for most babies to feel comfortable and cradles as they gently sway while buckled in. When your baby grows into the toddler stages, you can take out a portion of the cushion to make room for your toddler to use the lounger as a small chair. For babies with acid reflux who need to be in an elevated position after eating, this is an easy alternative to laying them in a crib. Since you won’t have to use batteries or plugs, you will have to give the lounger a little push every so often to help continue the momentum. If you want to pick it up to move from room to room, it might be a little on the heavy side for some parents or caregivers. For some, the price may not be worth the product, since there are no added toys, sounds, or built-in vibrations. These are all things that often attract parents and babies to loungers. 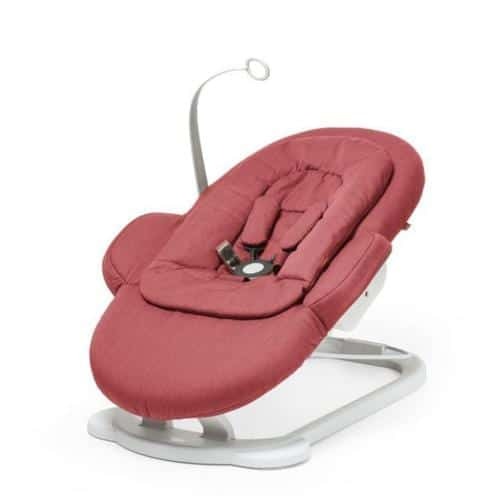 The Bloom Coco Go 3-in-1 Baby Lounger is similar to the Nuna Sena Leaf Curv in its general shape and simple design, but it also comes with a couple of bells and whistles to make it stand out. It’s not an electric bouncer, but it does have two different vibration settings to help comfort and lull your baby as he or she sits in the lounger. There’s a convenient five-point harness to keep your baby safely buckled while in the lounger and the three different recline settings make it easy to find the perfect position for your little one. Because of its safety and ixe, you can use the lounger for your baby from birth to 25 pounds, making it something your child will use for a long while, so the investment may just be worth it for your family. And when you need to be on the go, the lounger can collapse flat to fit in its carrying bag. On Amazon, the Bloom Coco Go 3-in-1 Baby Lounger is $125. Check out the latest price! The 100 % organic cotton fabric is relatively easy to clean. This is important because of the many messes babies tend to make. It has multiple vibration settings, which can help relax and soothe your baby without needing to sway the lounger as they lay in it. You can easily take it on the go with you and pop it back up when your baby is ready to use it. For some, the vibration might be a little strong or loud when on. Although cleaning the actual seat cover isn’t difficult, actually getting it back on the lounger can be a struggle. The Baby Bjorn brand is almost synonymous with solid baby products, so you’d be smart to trust in the Baby Bjorn Bouncer Balance Soft when comparing it to the equally impressive Nuna Sena Leaf Curv. Like the Nuna Sena, the Baby Bjorn has a natural bounce to it that occurs by you helping it along or by your baby’s own kicks and squirms. But given the size and design, the bouncer can actually be used for your baby from birth to two years old as a small toddler chair. The bouncer has three different seating positions — one for rest, one for play, and one for sleep. All can be beneficial to your growing baby and help prevent them from growing dependent on just one position with the bouncer. Plus, the ergonomic shape helps distribute your baby’s weight evenly on the bouncer and helps to give his or her head, neck, and back more added support. On Amazon, the Baby Bjorn Bouncer Balance Soft is $122. Check out the latest price! With three different seating positions, it won’t be very difficult to find the position that works best for your baby. When your child is ready, you can turn the bouncer over and effectively turn it into a comfortable toddler chair. Since the bouncer moves by your baby’s own movements, it can help them start to train their fine motor skills. With the black bouncer, you might find that animal fur and dust show very easily and it’s often difficult to keep the bouncer clean. If your baby is particularly small or young, their kicks may not be enough to help the bouncer move for them. The most upright position of the bouncer still may not be high enough for your little one. The Stokke Steps Bouncer is another one that has the ability to teach your baby how to soothe him or herself. Since it only requires a slight movement on your part, the bouncer is designed to be able to sway gently afterward and can continue to be moved by your own baby’s movements with their feet or arms. Depending on your baby’s weight, there are multiple settings to fit them properly and you can either use the bouncer as is or clip it into the Stokke Steps Chair to create a high chair that keeps your little one safely strapped in at all times. And if you do decide to use it with the chair, you can always go back and forth between using it alone or using it with the Stokke Steps Chair. The bouncer also has a five-point harness and like some other bouncers of the same style, it can lay flat for both travel and storage. There’s also a handy toy hanger that curves over the top of the seat for you to fasten your baby’s favorite toy too if you wish. On Amazon, the Stokke Steps Bouncer is $182. You can use the bouncer either on the floor or with the Stokke Steps Chair to really get the most out of it. The bouncer itself is less than eight pounds, so moving it from room to room or taking it with you doesn’t have to be difficult. By using your baby’s own movements to actually move, the bouncer helps teach them to calm his or herself. For some, the actual bouncing part of the lounger may be too noisy for everyday use. If you have a smaller baby or a newborn, he or she likely wouldn’t be able to bounce without your help. Right off the bat, it’s hard to deny how sleek the BabyHome Wave Wooden Rocker looks with its simple laminated wooden base and comfortable padding to keep your baby comfortable in the seat when cribs, playpens, and other bouncers just won’t do. And for some babies, finding a solid high-end bouncer like this may be what is necessary. With front to back rocking motion created by your baby’s own movements, the rocker also has two different reclining positions and can be folded down completely for easy storage. The three-point harness will help keep your baby safely fastened in the rocker just in case you have any worries about him or her falling out while trying to relax. And just in case of any accidents or messes, you can take the fabric off the clean it with ease before slipping it back on. On Amazon, the BabyHome Wave Wooden Rocker is $151. Check out the latest price! The rocker folds completely flat for easy storage and to easily take it with you on the go. Its overall design is stylish and modern enough to keep it out in the common areas of your home instead of constantly putting it away and taking it out to use. When in motion, even though those motions may be relatively small, there’s no off-putting squeak or sounds that come from the rocker. Since your baby is supposed to make the motion by him or herself, the bounce in the rocker might not be strong enough. Even with two different reclining positions, there’s still the chance that neither works great for your little one. Depending on the personal needs of your own family, you always have the option to go with one of the baby loungers that compare to the Nuna Sena Leaf Curv. After all, it may not have everything you want or need a good lounger or baby bouncer. But because of its simplicity and clean design, you probably don’t find one easier to use or one that fits in with your living room or bedroom quite as nicely. 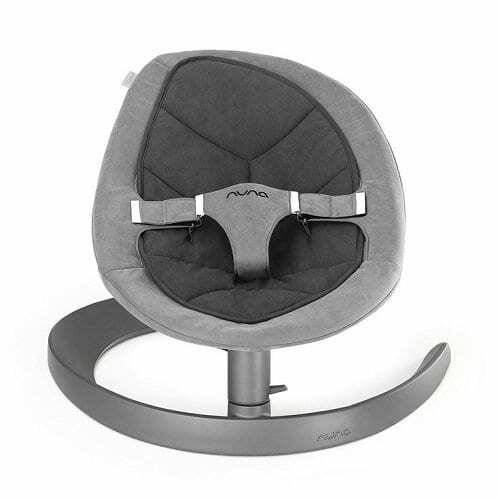 Aesthetics aside, the Nuna Sena Leaf Curv is a lounger that puts you in control of the speed and length of time and since it’s not constantly moving, your baby won’t grow dependent on the same kind of move in order to fall asleep each and every time. Go with whichever baby lounger will work best for your family, but the Nuna Sena Leaf Curv is a simple yet effective option overall.